Plymouth is the main urban area within the operating area of First Devon and Cornwall and an area of vital importance to the ongoing success of the business. 2006 has been a landmark year in Plymouth City Council’s relations with First Devon and Cornwall following a number of successful joint initiatives. Between November 2005 and November 2006, passengers in Plymouth have increased by 32 per cent, with 26 per cent a result of people taking advantage of the Government’s free travel scheme for the over 60s. This reveals ‘real’ passenger growth of 6.3 per cent. Nine new double-decker buses have been introduced in partnership with Plymouth City Council on the city’s The George Park and Ride service. These buses are fitted with Euro IV engines, one of the cleanest diesel engines currently on the market. Not only is the Park and Ride helping to reduce the number of cars entering the city centre, but the new engines are reducing CO2 emissions, helping to improve the local environment. 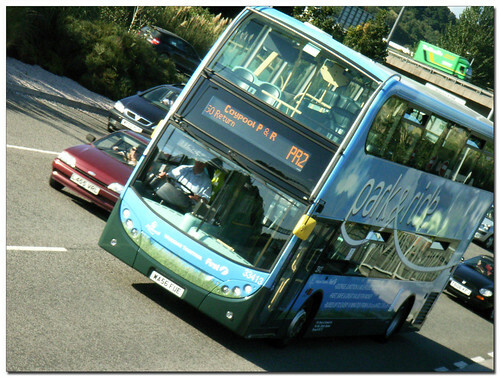 The upgrade of the bus fleet in Plymouth has brought the average age of the fleet down to 6.5 years, significantly below the Department for Transport’s target of eight years. 87 per cent of the bus fleet in Plymouth is now low floor, easy access. The working relationship between First and Plymouth City Council on a number of highly successful joint initiatives has contributed to boosting bus patronage, improving public satisfaction with public transport,and enhancing the image of buses and sustainable travel in Plymouth. The above, rather glowing report comes from no less than the CPT (Confederation of Passenger transport) annual report on the state of the bus industry in this country. local authorities and bus operators. Omnibuses 2.0 has a post on the subject here which as usual is worth a quick read. Two posts tonight as I wont be posting anything tomorrow as its my Dads funeral. Thanks to all the messages of support over the past week or so. Its been very helpful!